The Python has walked into the trap set by Nnamdi KANU. I told you and I told you earlier that force will never work in this situation. Now a petition will be filed against Our Nigerian Military and Government. You do not break a glass cup because it is easy for you to throw it on the rock. However, you might need the glass cup sooner than later. President Buhari has made a hero out of Little Nnamdi Kanu. Even if he is assassinated as he has alleged, he will become a Martyr. Nnamdi kanu arrived Nigeria 2 years ago and informed DSS about the hotel where he was lodging, DSS operatives later went to the hotel and picked him up and he was illegally detained for about two years. 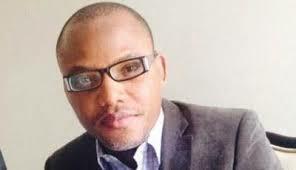 There was no tangible evidence to persecute him in the court, Nnamdi Kalu was released into the Nigerian milieu. Everything has worked as Nnamdi Kanu planned before he left London about two years ago. He started causing palaver for the Nigerian Government and he could not be nabbed. The most recent trap of Nnamdi kanu was perfected during his visit to Arochukwu where he said that he will go to Abuja in October 17 during his next court date with two million Biafrans and that he will come back with Buhari’s head. Mr. Nnamdi kanu was very crafty about his state in a way that it cannot be used against him, this state statement and other once some analyst believe is well calculated to force the Government to act irrationally, the North and his military loyalist could not take it anymore. President Buhari walked into the trap of Nnamdi Kanu and his IPOB movement with his Operation Python Dance. The high spirited Nigerian soldiers who just came back from Sambisa fighting Islamic terrorist Bokoharam were drafted to kill peaceful IPOB members struggling for self-determination in the Biafra People. Many unarmed civilians were tortured and killed. The Python has walked into the trap and cannot continue to dance. Federal Government on the bid to dance the python dance Proscribing IPOB as a terrorist group. The international community will not agree with that term because IPOB has been peaceful. Nnamdi kanu carefully calculated this move in other to trade the small local political support which he no longer trust because of the desperation of the politicians that will want anything to disrupt their business with the global political support and it is paying off. Following the Mr Jean-Claude Junker European union president on the brutal and inhuman video of the Nigerian army against the invasion, terrorism, and killings of IPOB members, which has been going viral over the internet. The president of the EU commission Mr Jean-Claude Junker has openly made a serious touching statement as well as warning the Nigerian security personnel against their ill hearted and unprofessionalism in handling democratic issues and the rights of the people… Junker directed a serious caution towards the Nigerian Military chiefs stating that they must employ every democratic tenet in handling issues that concerns disgruntle and agitations. This have also influence the heavy Biafra presence in the United Nations 72nd section which started on 15 September 2017 and will for sure influence the sense of judgment of the world leaders that have started gathering in New york. This was believed to be the plan of Nnamdi kanu which Nigaria could not see through, like Nnamdi kanu or hate him outsmarted Nigeria the first time during his arrest and he have done it again he knows that trading the Governors of South East and South south to get the support of European uinion is like trading Rangers football club of Enugu to get Manchester united of England in a matter of this nature. The question is who plays next and the likely game to be played let keep our hands cross as we pray for God to prevail and also for those in power to learn to respect the will and wish of the people and always remember that the beauty of democracy is the strength of the will of the people.